The KC Streetcar celebrated its second birthday on Sunday by simply doing its job. Two years earlier, the Downtown KC Streetcar service opened to much fanfare after five years of planning, designing and construction. With four vehicles and 2.2 miles of route, the KC Streetcar completed 4,037,499 trips since opening day in 2016. 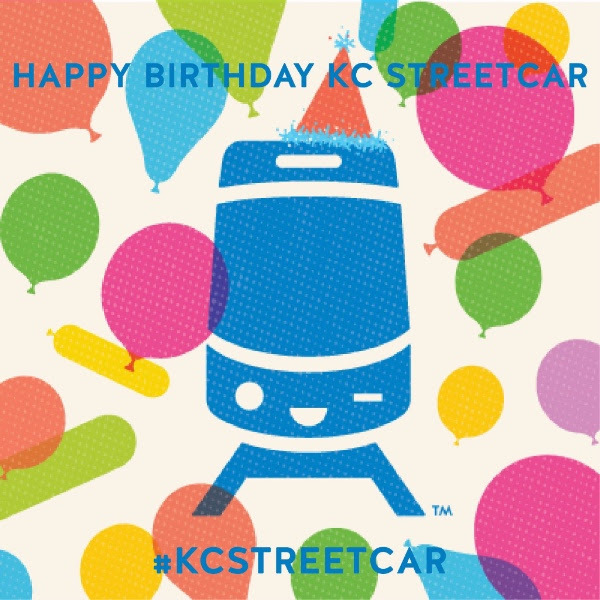 During the first two years of service, the KC Streetcar traveled 257,840 miles and logged 32,550 vehicle hours. The KC Streetcar team (operations and maintenance) has 30 employees who keep the streetcar running 7 days a week, 365 days a year. In addition to providing free, reliable and efficient public transit, the KC Streetcar also supports local businesses, events and the arts community by supporting programs such as Art in the Loop, National Travel & Tourism Week, Downtown Dazzle, Techweek Kansas City, and more. The KC Streetcar has made a difference for visitors, employees, businesses and residents. “I work in the Crossroads Arts District and live in Columbus Park. Every day I walk from home to the City Market streetcar stop and take the streetcar to the Kauffman Center stop. Having the streetcar has allowed my family to support public transit and become a one-car family,” said AJ Harbison, downtown resident. Since streetcar service began, there has been at least 20 new businesses open along or near the Main Street route. As response to the demand in ridership, the KC Streetcar Authority ordered two more streetcar vehicles for the Downtown route. Those vehicles should arrive in 2019. Additionally, the KC Streetcar Authority, along with the City of Kansas City, the KC Area Transportation Authority and Port KC, are planning for future streetcar extensions north towards Berkley Riverfront as well as south to UMKC. More information on both of those projects can be found on the KC Streetcar website. The KC Streetcar is one of many amenities that’s adding fuel to the housing boom in Downtown Kansas City. Maintaining existing affordable housing stock and increasing that inventory are critical for the sustainability and continued growth of greater Downtown Kansas City. We’ve come a long way from the blight of the late 1990’s, but have much work still to do. In greater Downtown Kansas City today – 31st Street north to the Missouri River, and State Line east to Woodland – residential housing density is among the lightest of any of our peer cities and many new opportunities remain. To place Downtown on the path to a long-term, balanced mix of housing inventory will require an updated revitalization strategy. Kansas City has accomplished most of the plan that was published in 2000 by Sasaki Associates. The Downtown Council agrees that it is time to update this plan. Department of Housing and Urban Development and census guidelines define affordable rent as up to 30 percent of household gross income. HUD‘s Jackson County individual median income ranges from $41,900 to $52,375. At year-end 2016, there were 14,189 total rental housing units in greater Downtown, and growth continues. According to census data, 6,055 or 42.6 percent of those housing units are considered affordable, according to HUD’s criteria. Market rate rents are increasing as new value is created, growing the tax base. These data paint a picture of a Downtown with a healthy mix of affordable and market rate housing. With its residents paying a median 41 percent of their income for housing and transportation, versus 48 percent in the whole city, Downtown rates as the most affordable neighborhood in our region, with 53 percent of its population a cross section of African American, Hispanic, Asian, Native American and those of mixed ancestry – almost twice as diverse as any other part of our region. And, currently, 41 percent of the 26,000 residents in greater Downtown are millennials – the largest percentage in any neighborhood in the metropolitan area. As you move away from the city center, the percentage drops to 26 percent for Kansas City and 22 percent for the greater region. Younger generations are our future and we must be competitive to retain them. In 2000, only those in the vanguard of urban living were willing to pay below-market rents for an apartment in an amenity poor environment. That is not the case today with arts, culture, entertainment, retail, streetcars, employment opportunities. Today, the greatest threat to affordable housing begins with the state of Missouri’s ill-conceived refusal to allocate funds for Low-Income Housing Tax Credits, or LIHTC, which are essential to the development of new affordable inventory. Right now, a 400-unit LIHTC, rent-restricted, affordable housing project planned for the Central Business District is unable to advance without those credits. We should be sounding the alarm. An effective strategy would be to unite as a community to educate legislators on why affordable housing and these tax credits are so important. LIHTC obligations on existing inventory will be expiring over the next several years. Property owners will be reviewing their options on what the next iteration will be: continuing as affordable, converting to market rate or another use. Many will determine that the upward delta in rent doesn’t justify the investment required to make their properties competitive. Understanding the importance of affordable, workforce housing, the Downtown Council remains committed to work with the city and community to develop a comprehensive plan promoting affordability. We are steadfast in our dedication to attracting new jobs and residents, and growing the tax base within a diverse, affordable and walkable urban community. Bill Dietrich is president and CEO of the Downtown Council of Kansas City. The Downtown Council’s State of Downtown Report – an online dashboard that illustrates the progress that Downtown has achieved in quality of life categories such as economy, housing, development and quality of life – was published this week.. Downtown Kansas City seems to be a magnet for millennials, The Kansas City Star reported on Wednesday. Out of nearly 23,000 people who live in the city center, 41 percent are part of Generation Y, according to a new report from the Downtown Council and MySidewalk, a KC-based software company. According to the report, many of these Downtown dwellers have never been married and don’t have kids. The mix is also among the most diverse in the metro area. And most say they’re pretty pleased with their quality of life. The Downtown Council defines Downtown Kansas City as the area bordered by the Missouri River, 31st Street, the state line and the 18th & Vine Jazz District. The concentration of millennials — those born between the early 1980s and mid-1990s — fades as you get further into the suburbs, contradicting a recent local housing survey that found that millennials prefer suburban houses to urban lofts. Millennials make up 26 percent of the Kansas City population and 22 percent of the metro population according to the “State of Downtown” report, which was put together from objective data sources such as the U.S. Census. About 20 percent of downtown dwellers belong to Generation X, and the same percentage are Baby Boomers. The remaining population consists of older “Matures” (about 6 percent) and Generation Z (about 13 percent), those younger than millennials. The report also found that Downtown Kansas City’s population is almost twice as diverse as surrounding areas. About 53 percent of downtown dwellers are of African-American, Hispanic, Asian, Native American or mixed ancestry, compared to 27 percent in the greater metro area. ▪ The median household income is $41,185, and the median home rent is $826. ▪ The average household size is 1.74 people, compared to 2.53 metro-wide. ▪ More than half of downtown residents have never been married. ▪ There are around 81,740 jobs Downtown, more than in the downtowns of peer cities such as Cincinnati, San Antonio and Salt Lake City. More than half of downtown KC employees earn high wages, defined as $3,333 per month or more. ▪ The most common jobs available Downtown include sales (1,309 jobs), management (1,233), office and administration support (1,141) and business/finance (1,008). ▪ Nearly 84 percent of people who live Downtown say they’re satisfied with their quality of life, though it seems many would love to see an urban Target in the neighborhood. Around 62 percent say they’re satisfied with the value received from their tax dollars. ▪ Around 59 percent of residents say they feel safe Downtown. They reported the strongest feelings of safety around Crown Center, Hospital Hill, the River Market and the Crossroads. The Central Business District and southeast portions of Greater Downtown Kansas City were rated as feeling less safe. The Downtown Council, working in collaboration with mySidewalk, published the State of Downtown report last Friday in conjunction with the DTC’s Annual Luncheon. The online platform is built to report objective data that captures progress and trends, as well as distinguishes Downtown KC locally, regionally and nationally. Even though the online dashboard has been available for just one week, it ranks as one of mySidewalk’s top 10 most viewed dashboards among its established list of partners with more than 800 views. City Manager Troy Schulte, right, was among the first to tour the Atlas residential building during a grand opening ceremony last week. The property features 16 unique living units in the Crossroads.Downtown Council members and stakeholders gathered last week to celebrate the grand opening of Atlas, the latest residential property in Downtown KC, and to welcome prospective tenants and guests. 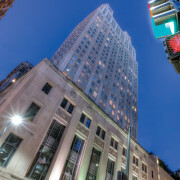 Atlas Lofts, 1509 Walnut, is a fully restored boutique property artfully blending old world charm and modern amenities. It features 16 superbly appointed, one-of-a-kind units. Nestled on the northern edge of the creative hub of the Crossroads Arts District, Atlas is one block away from the KC Streetcar, a neighbor to Sprint Center, and in easy walking distance to the heart of Downtown. A ribbon-cutting ceremony marked the official opening of Atlas, the latest residential property in Downtown. Participants included principals Jason Swords, Sunflower Development; Jeff Krum. Boulevard Brewing; Jay Tomlinson; Helix Architecture + Design; City Manager Troy Schulte, Crossroads champion Suzie Aron; and Councilwoman Jolie Justus. More than 60 guests turned out for the Downtown Council’s grand opening ceremonies that included remarks from Jeff Crum, CEO of Boulevard Brewing Co. and a principal in the Atlas project, along with City Manager Troy Schulte, and City Councilwoman Jolie Justus. The Downtown Council played host to a grand opening celebration of the restored Atlas building at 1509 Walnut last week. Designed by a noted Kansas City architect in Romanesque Revival style, Atlas was constructed in 1902. It first housed the Grand Avenue Storage Company, then Atlas Storage and Transfer, followed by the Berlau Paper Company, before falling into a period of neglect and decline. Today, the magnificent structure—listed on the National Register of Historic Places—has finally found its true calling. Every unit in Atlas is unique, each possessing its own exclusive features and a variety of today’s hottest amenities. A partnership by principals from Sunflower Development, Helix Architecture+Design and Boulevard Brewing came together in 2015 to acquire the property and charted a bold new course, affecting a complete restoration in keeping with the rigorous standards established by the Department of the Interior. For more information about living and leasing at Atlas, visit atlas-kc.com; go to leasing@atlas-kc.com or call 816-533-5609. The River Market Off Leash Area is open at 5th & Locust from sunrise to sunset daily. Downtown KC’s newest dog-friendly space – the River Market Off Leash Area (RMOLA) at 5th & Locust – is inviting local pups (and their faithful owners) to take off the leash and run free! The new RMOLA is a product of the River Market Community Improvement District (RMCID) and the River Market Community Association (RMCA). They have advocated for the new fence, off-leash area in the River Market. The RMCID manages and maintains the OLA on property which is leased from the Missouri Department of Transportation. “The River Market OLA provides a place where people and their well-behaved dogs can socialize and exercise in a clean, safe environment, without endangering or disturbing people, property or wildlife,” said Mark Rowlands, director of the RMCID and chairman of RMCA. The OLA is open from sunrise to sunset. Admission is free. And, be sure to join the RMOLA Facebook page and post your favorite photos of your pooch(es) socializing and blowing off some steam. An open letter on the arts and ArtsKC by Mayor Sly James. Last fall, I wrote An Open Letter to America addressing the many assets Kansas City has to offer. It came on the heels of our Kansas City Royals playoff run, but it wasn’t about baseball. Instead, the letter was intended to draw attention to our elevated profile across the U.S. and to highlight all the ways in which Kansas City is winning. The Kansas City Arts Community is a large part of our rising profile – and rightfully so. Our Arts are incredibly vibrant and we are being recognized as a leader in many disciplines including fashion, theater, jazz, song and dance – just to name a few! In fact, we are one of only a handful of cities across the country that have all four of the major arts – opera, repertory theater, symphony & ballet. As we continue to build our reputation as a world-class city, the Arts are truly making us shine. This Friday (today) our regional arts council, ArtsKC , will launch their annual digital giving campaign – #timetogive. This important campaign is essential to the vibrancy and vitality of Kansas City’s world-renowned arts scene. By contributing to the ArtsKC Fund, you are funding grants to artists, arts organizations, and arts programs from all over the region. Accessibility to the arts should be open to everyone and ArtsKC does that by funding grants that support transportation and education programming in diverse and underserved communities, and by working with organizations to provide free events throughout our five-county region. I love this City and I find more reasons to appreciate & celebrate it every day. As we continue to see our name landing on Top 10 lists, our Arts will continue to propel us straight to the top. I hope you’ll consider making a contribution – yes, right now – consider it a significant investment in your City. The Kansas City Power & Light District announced plans last night for the 24-story, 300-unit, $105 million Two Light luxury apartments. This marks The Cordish Companies’ second market-rate, high-rise apartment building in history of Downtown Kansas City. The City of Kansas City and The Cordish Companies announced plans Thursday for the eagerly-awaited $105 million, 300 unit Two Light Luxury Apartments, the second of four planned luxury high-rise apartment buildings in the Power & Light District and yet another substantial investment along the soon-to-be-complete streetcar line. Two Light brings the total of streetcar-related investment in Downtown to more than $1.1 billion and brings the total of market-rate new construction Downtown apartments announced since the beginning of construction of both the streetcar and One Light Luxury Apartments to more than 3,300. Two Light will be located on North Truman Road, between Walnut Street and Grand Avenue in the heart of the Power & Light District and across the street from the Sprint Center. It will rise 24 stories, with a 6-story garage including 499 parking spaces, a luxury amenity deck with infinity pool, bar, demonstration kitchen and theater room directly above the garage and 18 floors of studio, 1 bedroom, 2 bedroom and penthouse apartments. Select penthouse units will be two stories and include their own private terraces. The apartments will include quartz countertops, luxury flooring and cabinetry, tile bathrooms and state-of-the-art appliances. Like its sister building One Light, Two Light will feature floor-to-ceiling windows in every living room and bedroom. The first floor of the building will include 15,000 sq. ft. of office space and 3,100 sq. ft. retail space. Two Light will create more than 1,500 full-time jobs and will bring another 450 full-time residents Downtown, with a 25-year tax benefit to the City of more than $45 million. It will also bring a 2nd tower crane to the Power & Light District and a 4th to Downtown, emblematic of Kansas City’s accelerating growth and a symbol to developers nationwide. “The importance of the continued residential renaissance in Downtown cannot be understated,” said Bill Dietrich, president and CEO of the Downtown Council of Kansas City. “One Light and Two Light are setting the new standard for luxury urban living in our region. Construction on Two Light, which is only the second market-rate, new construction high-rise apartment building in the history of downtown (One Light was the first) is expected to begin in early 2016 and complete in early 2018. Downtown Kansas City has been on quite a roll recently as a result of a variety of factors including the residential development explosion, the impending completion of the streetcar, nationally televised watch parties for the World Cup and the Royals’ World Series run, the recent opening of one of the region’s best department stores at Halls Crown Center, the announcement of Techweek Kansas City in 2015 and a growing litany of other positive developments. The country has taken notice, with Kansas City seemingly on every national hot list for places to visit and millennials to move. The announcement of Two Light represents another positive milestone for the Power & Light District, which recently topped 90 percent occupancy while welcoming new tenants Onelife Fitness, Visit KC, Cleaver & Cork and Yard House. One Light Luxury Apartments is now seven months from completion, with unprecedented pre-leasing velocity. Move-ins are scheduled to begin in November. The early success of One Light along with the symbolic import to other developers of new construction high-rise development has led to a flurry of announcements of other neighboring apartment projects; bringing an influx of nationally renowned multifamily developers and many hundreds of millions of dollars into the Kansas City market. The announcement of a second high-rise apartment building will accelerate that momentum. Crossroads Academy has officially launched construction on its new 21st Century Middle School located at 1009 Central. During an internal school celebration on Tuesday (Sept. 16), 5th-7th grade students helped jump start demolition as they used sledgehammers and mallets to bring down walls in the newly acquired building. 5th grade students at Crossroads Academy stand ready to begin knocking down walls. Guests on-hand for the school celebration included representatives from DST, Americo Financial Life & Annuity, McCownGordon Construction, BNIM Architects, MC Realty and the Downtown Council. During the 14-week construction project, 1009 Central will be transformed into a 21st Century Middle School equipped with Science Labs, Learning Studios, a Multipurpose Room, Common Areas, School Kitchen and Performing Arts Studio. Executive Director Dean Johnson noted the importance of this new facility during the launch celebration. Construction is scheduled for completion in December 2014 and will open for students when they return from Winter Break on Jan. 6, 2015. 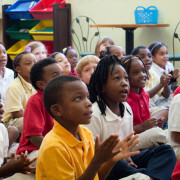 For more information about Downtown’s charter school, visit the Crossroads Academy website. You can find them where there’s live music, trendy food, an affordable home and a friendly environment where they feel they can make a difference. And in some very encouraging ways, both statistically and in the mysterious world of “buzz,” the Kansas City area is holding its own when it comes to appealing to the hot demographic called millennials. A study recently ranked us among the top 20 big U.S. metros when it came to adding young adults, according to a recent story in The Kansas City Star. It’s not just about being hip. Attracting those people born roughly between 1982 and 2004 is considered vital to the metro’s economic future. Just recently, MindMixer, an Omaha Web-hosting firm, announced it was moving to the Crossroads Arts District and creating 85 jobs, citing the area’s urban vibe and pool of tech-savvy people. To help further that favorable impression, the Kansas City Area Development Council launched a talent recruitment initiative to help local companies sell the area to young potential employees. Among its tactics is a scavenger hunt aimed at getting summer interns — brought to the area by big local corporations such as Hallmark, Cerner and Garmin — off the couch and discovering the charms of places including Brookside, Westport and the River Market. Having more young people around also makes this a better place to live for all generations. Mayor Sly James, whose streetcar push is particularly appealing to the millennials’ affinity for urban living, said keeping and adding that age group to the local mix was a formula for a better future. When it comes to hard numbers, the area ranked 14th among the nation’s 51 metros with populations over a million when it came to adding young adults, according to a recent report from the Brookings Institution. The Kansas City metro had an annual net gain of about 2,200 people in the 25 to 34 age group during the three-year period from 2009 to 2012. Though far below red-hot places such as Denver, which added almost 12,000 young adults each year, it ranked ahead of Atlanta, New York, Boston and Los Angeles. The area also is doing well in the online universe of social media, that place where buzz is generated and many younger adults pick up their impression of places. That’s not surprising to Chel O’Reilly, who grew up in New England and lived in Brooklyn — considered hipster-central by many of her generation — for a year before coming here. At age 35, O’Reilly considers herself on the cusp of the millennial generation, but she shares the interests often cited by young adults when it comes to where she wants to live. One of the bigger draws listed by Vocativ, which bills itself as a “take-no-prisoners” online news source, was Kansas City’s affordability. The average monthly rent for a two-bedroom apartment here was $710, making the city the eighth cheapest place to live among the 35 cities that made the hipster list. Adding to the inexpensive allure, Vocativ also found the seventh largest number of vintage clothing stores per capita here. Living somewhere you can devote more time to your passions and less to paying rent is what appealed to Francisco Alarcon, a 31-year-old native of Spain. He moved here last fall from Los Angeles after graduating from architecture school to work as a sports architect at Populous, but is an artist in his spare time. “I was hesitant about the art scene here and I asked my friends in LA who told me Kansas City has one of the best art scenes in the U.S.,” he said. “It’s also cheap to live here. Another architect colleague at Populous, Geoff Cheong, hails from Vancouver. After graduating from architecture school in British Columbia in 2007, he was invited by Populous to come to Kansas City for an interview. Cheong’s first home was a downtown loft, and he quickly discovered Kansas City was no Vancouver when it came to urban living. One of the missing ingredients was mass transit. But with a car, Cheong enjoyed the ease of getting around the area. He now lives in a suburban apartment complex at Interstate 435 and Roe Avenue. And in a surprising twist for a Canadian, he actually has more opportunities to play hockey here than he did in his hometown. “It’s more affordable and there’s more rink time available,” he said. “I meet other Canadian transplants at hockey rinks.… I’ve lived here 6½ years now and I think that’s a credit to Kansas City. Alarcon also has found a welcoming place. O’Reilly, the New England transplant, says its easy for millennials to find an “instant community” in Kansas City. “Kansas City is rich with a lot of good people who open their arms to let more people in,” she said. “I don’t feel it’s a closed city. O’Reilly also belongs to a group of about two dozen younger adults who call themselves “Possum Trot,” an early historic name for the area. They include newcomers to the city as well as natives who gather regularly to socialize, discuss the city and invite speakers. Among those returnees involved in Possum Trot is Kathleen Bole. The 25-year-old grew up in Prairie Village but left for graduate school at the University of Pennsylvania in Philadelphia in 2011. Bole also did internships in Washington and Chicago, so she knows a bit about what’s going on elsewhere in the nation. “I packed my bags and moved East and didn’t think I’d come back,” she said. But after graduating with a master’s degree in city planning in 2013, she began to think more fondly of her hometown. “Kansas City doesn’t have a lot of things other cities have in the way of walkability and transit, but I like the work-life balance you can have here, which you don’t have as much on the coasts,” Bole said. “Living in Philadelphia, I realized a young professional just coming out of school was not the easiest way of life, and you have a better quality of life here. One of the biggest challenges facing Kansas City when it comes to attracting millennials is its an unknown quantity to most people around the country, Marcusse said. “They think it’s a cow town or flyover place,” he said. 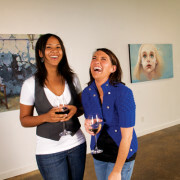 Using the theme of “America’s Creative Crossroads” (KCCreativeCrossroads.com), the organization has developed marketing materials, both online videos and printed, aimed at appealing to millennials. Attributes included the city’s music scene, restaurants and food trucks, the appeal of professoinal soccer with Sporting Kansas City, the tech scene and Google Fiber and, of course, the relatively low cost of living here. One of the more fun initiatives is the scavenger hunt launched last year. About 1,000 summer interns participated. Each received a booklet listing 11 areas of the metro from greater downtown and midtown, to southern Johnson County and the Village West area of western Wyandotte County. Five different attractions were listed for each area, and participants were invited to find them, take photos and post them on Facebook to score points. Prizes were awarded based on the places explored. Looking forward, while Kansas City has done reasonably well attracting millennials, those interviewed agreed the community could do a much better job if it had more walkable neighborhoods and mass transit. “I think the streetcar is a huge thing,” Bole said. “Knowing it was on the horizon meant a lot to me. To liven things up at the street level, the Downtown Council has embraced what’s called “tactical urbanism.” It’s intended to be a low-cost way to show the possibilities of making the city a more enjoyable and engaging place. For example, in 2012 design students from Kansas State University used inexpensive materials to temporarily transformed two blocks of Grand Boulevard into a narrower, more attractive street with wide sidewalks, landscaping and sidewalk cafes. The idea was to offer a glimpse at how a more liveable street could be created. Mike Hurd, marketing director for the Downtown Council, said the new tactical urbanism being pursued by his organization is designed to create a downtown “eco-system” for millennials. “What we find with millennials is a desire to see more activity on the streets and public spaces on an ongoing basis, not just big event nights,” he said. This summer, the Downtown Council is planning on holding noontime events twice a month at Oppenstein Park at 12th and Walnut streets with food trucks and entertainment. A plan also is evolving to hold monthly free concerts in the Crossroads Arts District on a Friday evening other than First Friday, the popular art gallery event. Dave Scott, chairman of the tactical urbanism program, said the emphasis is on inexpensive ideas to improve the urban environment. “We’ll win the battle if it’s a good place to live and work, and it’s fun and unpredictable,” he said. The major reinvestments in making downtown more appealable plus the positive social media buzz has helped companies recruit new talent. Bob White, director of international marketing at Populous, said his firm is finding it much easier these days thanks to the improvements that have occurred in the city. “Ten or 15 years ago, it was extremely difficult for us to recruit young people,” he said. “It was frustrating for us and it was based on ignorance and things they had heard about Kansas City and the Midwest from other people. “That’s flipped the last six or seven years. There is a groundswell, an undercurrent of young people, making this happen. People are less resistant and more open-minded. “They’re saying ‘yes, I’ve heard there’s good things happening in Kansas City,’ hearing it from their peers that’s it’s worth a second look. Leaders of The Cordish Companies and Kansas City praised the progress made in Downtown during the past decade as the group broke ground on the $79 million One Light luxury apartment tower, The Kansas City Business Journal reported on Tuesday. On Tuesday afternoon, Blake Cordish, vice president of the Baltimore-based entertainment district developer; Nick Benjamin, executive director of the Kansas City Power & Light District; Terry Dunn, CEO of the JE Dunn Construction Group;Kansas City Mayor Sly James; Bill Dietrich, CEO of the Downtown Council of Kansas City; and various members of Kansas City’s government and business community met at the corner of 13th and Walnut streets to commemorate the start of construction on the 25-story, 315-unit luxury apartment building. One Light — scheduled to open in late 2015 — will become the first new residential tower built Downtown since the 32-story San Francisco building opened in Crown Center in 1976. They hailed the progress made since the eight-block, $350 million entertainment district rose between 2005 and 2008 and said Kansas City can look forward to more progress in Downtown during the next decade. James said the credit for the success of the Power & Light District should go to former Mayor Kay Barnes, who spearheaded the development project. He said the tower — like his signature project, the 2.2-mile downtown streetcar— will serve Kansas City’s future residents and promote downtown development. You are invited to a milestone event in Downtown Kansas City at 2 p.m. Monday at 13th & Walnut. A ground-breaking ceremony is set for Monday in the Power & Light District, where officials will ceremonially welcome the One Light luxury residential tower to the Downtown neighborhood. The Cordish Co. will break ground on the 25-story apartment project at 2 p.m. Monday. It intends to make One Light the first of four residential towers that will be built in the Downtown Power & Light District. One Light, the first new residential tower built Downtown since the 32-story San Francisco building opened in Crown Center in 1976, was first announced 19 months ago, but Cordish officials said design tweaks to the 315-unit building delayed its construction start. To learn more about One Light, check out the project announcement in The Kansas City Star and a recent KCPT story about the project and residential growth in Downtown. KCPT, Kansas City’s public television station, is airing a new story about Downtown residential growth — in terms of population and residential properties. Check it out here! KCPT’s story on The Local Show provides a progress report on the growing Downtown population, as well as plans for several new residential developments in greater Downtown. Featured in the story is the new One Light residential tower that was introduced by the Power & Light District earlier this month. The luxury, state-of-the-art, 343,000-square-foot apartment building, developed in partnership with the Cordish Companies and the Kushner Companies, will launch construction with a groundbreaking ceremony on Monday, April 14. Downtown’s population has grown to nearly 20,000, and one of the Downtown Council’s leading goals it to double that number. The Downtown Council is working closely with Cordish officials and other developers to create more housing opportunities in the greater Downtown area. In the last year, that partnership has produced stories on the burgeoning Innovation District in and around the Crossroads; the Crossroads Academy charter elementary school in the Central Business District; and a progress report on the Kansas City Power & Light District.